The final version of the assessment grid from 2013 allows for describing and assessing energy-related sectors and specific sub-aims within the sectors, gaining insights about how each city is performing. What leads to a specific performance? Why are the cities below or above the average in certain sectors? Taking into account the governance aspects presented in the assessment grid, like long-term and mid-term targets or institutional settings, moreover derives information on possible reasons for a performance (Figure 1). Besides the information, for instance, that energy generation and consumption is assessed at a medium range, the revised version incorporates the performance into the governance framework. By adding an evaluation of the governance aspects, municipalities can see if this medium range performance is due to policy issues like missing long-term targets or low financial resources. 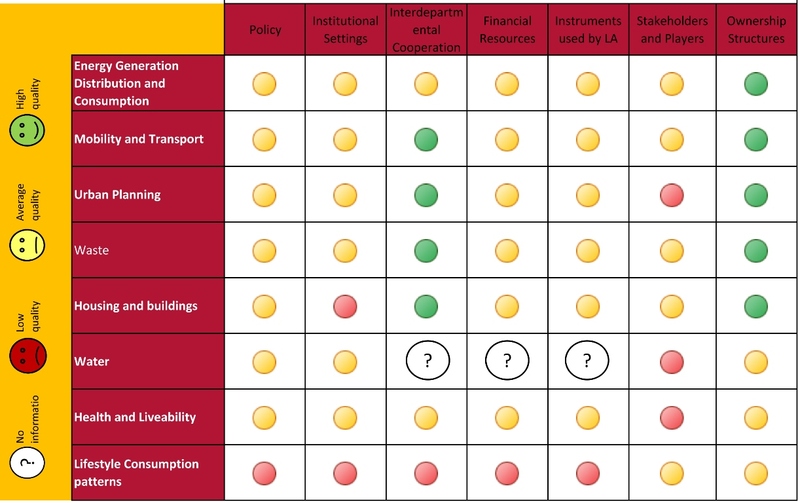 By adding insights about governance performance, it becomes easier to not only see which sector needs to be improved to reach the objectiveof becoming a low energy city with a high quality of life for all, but also how to do this, or which lever should be triggered as well as where the city`s next fields of action could be.